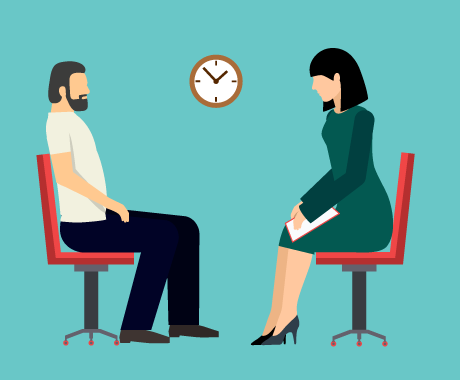 To help reduce stigma related to the use of methadone in an Opioid Treatment Program (OTP), CARF recently published an article discussing the need to change the conversation about methadone. To change the conversation, however, there is a need for better public understanding of what methadone is and how it is used as a part of comprehensive treatment for opioid use disorder (OUD). Many people continue to have concerns that using methadone, which is itself a type of opioid medication, to treat OUD means that methadone treatment involves simply switching one drug for another. Knowing more about how methadone is different from other prescription opioid medications, such as oxycodone and morphine, as well as different from illegal opioids such as heroin, will help to answer these concerns. Here are some answers to frequently asked questions to promote clarity and understanding. Q: Is methadone an opioid? As an opioid agonist, methadone attaches to the opioid receptors in the body and brain, which can prevent withdrawal symptoms for many patients. As a synthetic opioid, methadone is designed so that carefully prescribed and monitored doses do not produce the “high” or sense of euphoria that other opioids do. This allows patients using methadone as part of their ongoing treatment to drive, work, and participate in life activities. It is legal to drive while using methadone because it does not cause impairment as long as it is taken as prescribed and not mixed with other substances. Key to remember: OTPs are required to conduct regular drug screenings for all patients to help ensure that methadone is being taken as prescribed and to test for the presence of other substances such as benzodiazepines (Valium, Xanax, etc.) that can be dangerous when taken with methadone. Q: What is methadone used for? Please note: The scope of this article is limited to the use of methadone as a treatment for OUD. Methadone is used to manage physical withdrawal symptoms, help reduce cravings, and allow patients to participate more fully in their lives and communities while working to achieve and maintain recovery. Methadone doses are individualized to the patient and are adjusted as needed throughout treatment. Key to remember: Methadone is a safe and effective prescription medication that is used only as one component of a larger recovery plan. Q: How does methadone work? Key to remember: Methadone is used to manage withdrawal symptoms when a person stops using other opioid drugs. 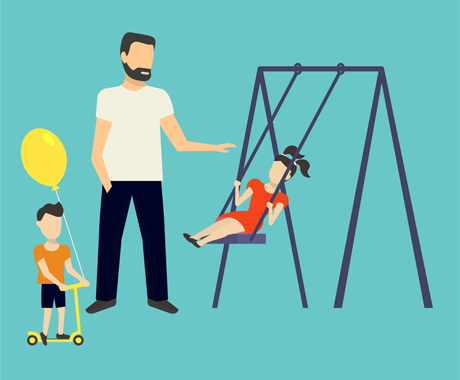 This can help a person stabilize and work to address their overall individual needs and behavioral or mental health issues, such as work, family life, and counseling. Q: Are there long-term health effects of methadone? Methadone is the most studied and widely used medication for treatment of OUD, and it has a track record of more than 50 years. Although methadone does have risks and potential side effects, it is a proven safe and effective medication that is approved by the FDA and SAMHSA for long-term use for patients with OUD. Many of the reported or perceived side effects experienced by some patients while using methadone likely are not caused by methadone. For example, patients have reported health conditions (such as pain, dental problems, loss of bone density, etc.) after beginning treatment. There are no clinical studies to support the idea that methadone causes these conditions. Often, patients entering treatment for OUD have been using illicit opioids for a long time, and many have existing health conditions or issues that have been undiagnosed. These may surface as the person begins to stabilize during treatment. This can lead to the perception that methadone is the cause. 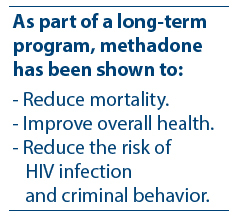 Key to remember: Methadone has a long track record and is considered safe and effective when used appropriately. Long-term use is beneficial for many patients, while stopping methadone maintenance treatment often leads to negative outcomes. Q: Can any doctor prescribe methadone? No. In the United States, the only setting in which methadone can be prescribed to treat opioid use disorder is an OTP. 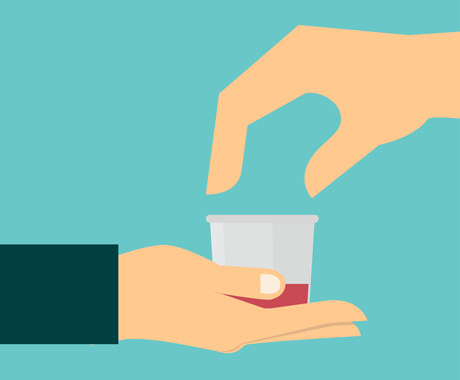 For optimal results with methadone, patients should also participate in a comprehensive medication-assisted treatment program that includes counseling and social support. OTPs provide a comprehensive approach to recovery, including individual or group counseling, and help with accessing community services. Many OTPs also offer integrated primary care, support for other chronic medical and psychiatric needs, and family supports. These programs must be certified by the Center for Substance Abuse Treatment (CSAT), a division of SAMHSA. To achieve certification, OTPs must meet strict guidelines and must be accredited by an approved accrediting body, of which CARF is one. CARF accredits more OTPs than any other accreditor. OTPs also must be licensed by the Drug Enforcement Administration (DEA), and they receive unannounced site visits from the DEA to monitor compliance with regulations and mandated procedures. A physician who is the medical director of an OTP must meet specific requirements related to licensing, expertise, and experience. These requirements are set by SAMHSA and supplemented by expectations specific to the accrediting body that accredits the OTP. Many states also have additional state-specific requirements for a physician to be qualified to direct an OTP clinic. Key to remember: Methadone can be prescribed as part of treatment for opioid use disorder only through a licensed and accredited OTP where it is carefully monitored and used as part of a comprehensive treatment plan. Q: Does methadone cure opioid addiction? No. Methadone can be an important component in a person’s recovery, but it is not a “cure” for opioid addiction. Substance use disorders are chronic illnesses that often must be approached with a comprehensive, holistic plan that includes counseling, education, and support services. Methadone is used as part of that plan to manage physical withdrawal symptoms and help reduce cravings. Key to remember: Methadone is one piece of an ongoing and comprehensive recovery plan for opioid addiction. Q: How long should people be on methadone? Many people assume that methadone treatment should be short-term. However, patients who remain in treatment and continue the use of methadone as prescribed statistically have better outcomes than those who do not. The length of time methadone is needed depends on the person, and some individuals need to continue methadone treatment throughout their lives. Stopping methadone treatment has several risks, including a high risk of relapse to illicit opioid use and a high risk of overdose if relapse occurs. Stopping methadone also increases risk of a return to criminal or other dangerous behaviors and often leads to the loss of stability gained from ongoing treatment and supports. Some patients are able to safely reduce or end methadone use over time, but this is not the primary goal of treatment. Instead, progress and success in an OTP are measured by factors such as employment, family engagement, and lack of illicit drug use or criminal behaviors. Progress and success in an OTP are measured by factors such as employment, family engagement, and lack of illicit drug use or criminal behaviors. The need for long-term methadone treatment was recently recognized by the federal government when Congress passed the SUPPORT for Patients and Communities Act, which made significant changes related to multiple aspects of opioid use, misuse, and addiction in the United States. One important element of the new law is that it expands Medicare coverage to include OTPs. Medicare historically has not covered OUD treatment, so this change will allow patients to enter or remain in treatment after they become eligible for Medicare at age 65. Key to remember: OUD is a chronic illness that requires long-term treatment, often for life. Clinical data show overall better outcomes for patients who remain on methadone maintenance treatment than for those who stop taking methadone. Learn more about opioid treatment and recovery. Great article everything was 100% true an i wish more people could learn this themselves and most importantly believe it. People tend to believe negative stereotypes in comparison to the facts provided by years of study.